The start of grilling season inspires foodies to explore new sources for quality meats. 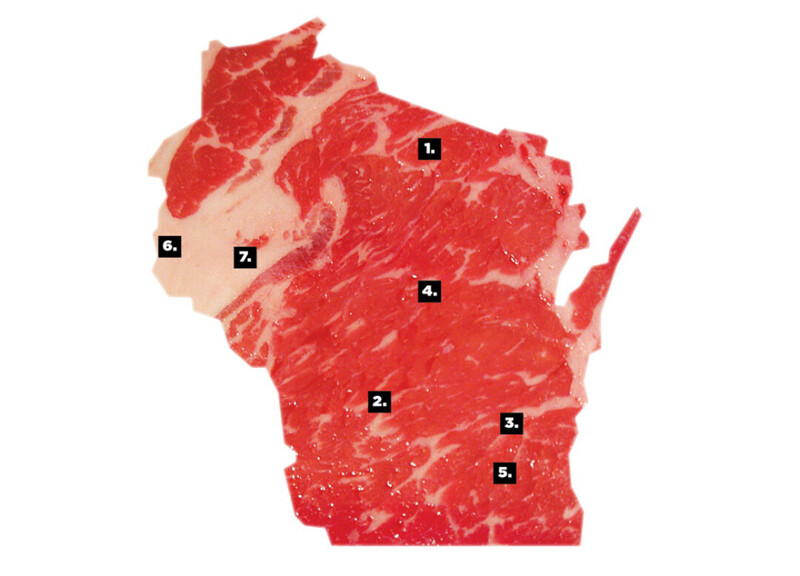 And with the farm-to-table movement growing in popularity, Wisconsin’s rich artisan meat culture is in the spotlight. Whether you prefer traditional sausages made from family recipes or a visit to the local butcher for a modern take on flavored brats, you can support these butcher shops and meat markets throughout Wisconsin. Featured on the Travel Channel’s Bizarre World, this charming market nestled in the heart of Lake Tomahawk draws customers in with intoxicating, smoky smells. They’re known for their famous beef jerky made from the finest cuts of meat, along with other cured delicacies and homemade ground sausage. Here you’ll step back into an era where trained butchers provide personal service and expertise on the finest quality meats and cheeses. Just minutes south of Wisconsin Dells, this award-winning butcher shop places a premium on meat sourced from local farmers. The focus is on fresh with an impressive 40-foot meat display case overflowing with beef, pork, and Amish organic chicken. An extensive assortment of flavored brats is available with tasty options like apple cinnamon, whiskey peppercorn, and the infamous “Packer” (sauerkraut and cheddar). They also specialize in meat processing and party planning. This old-fashioned meat market stays true to its roots, which date back 70 years and have earned the shop “Best in Wisconsin” notoriety. Continuing the tradition of homemade specialty sausages, fresh-cut meats, and bakery items, LeRoy Meats has expanded its products with the changing times to include unique items like flavored “Hot Rod” sausages and other tasty treats. Owners Dave and Sandy Tuskowski take an inspired approach to this market, drawing on their shared connection to family. Shopping at Ski’s is truly an experience in itself. Enjoy the music while strolling down memory lane, as Ski’s proudly displays family photos throughout the store. The commitment to quality is exemplified in their premium meats, deli, and seafood, as Ski’s provides some of the most delicious, freshest cuts in Central Wisconsin. Established in 1982, Northern Trails Meats continues to use all-original recipes to develop custom cut beef, pork, venison, lamb, and bison products. Best known for its smoked sausages sold in local groceries, homemade ham, and bacon, Northern Trails also offers a vast variety of brats, summer sausage, hot stix, wieners, breakfast links, and bologna. Founded more than two decades ago by deer farmers, Specialty Meats & Gourmet only offered venison in its early days. Now the store is focused on being the source for specialty wild game and exotic meats – everything from alligator to yak! This family-owned, customer-centric market also offers domestic meats such as beef, pork, chicken, lamb, and venison along with locally made sauces, rubs, and cheeses. While it’s only been open a year, Rump’s has made mouthwatering waves across the Chippewa Valley – and beyond – for its huge selection of beef, pork, chicken, and much more. Rump’s is a palace of meaty delights right in downtown Altoona, where they make more than 200 items in-house, from bacon and brats to snack sticks and wieners. You can also buy Rump’s products as venues as diverse as Bracket Bar, Bug Eyed Betty’s, and Eau Claire Express baseball games. For more on what to do and see in Wisconsin, go to travelwisconsin.com. Volume One's guide to everything meat! Grilling tips, local meats, preparation, and more!